I’ve always been curious about however whenever did it come to be that ham is the protein of choice at Easter. But if we’re going to have brunch AND we’re going to serve, I figured we should do it in a fun, easy and yummy way! 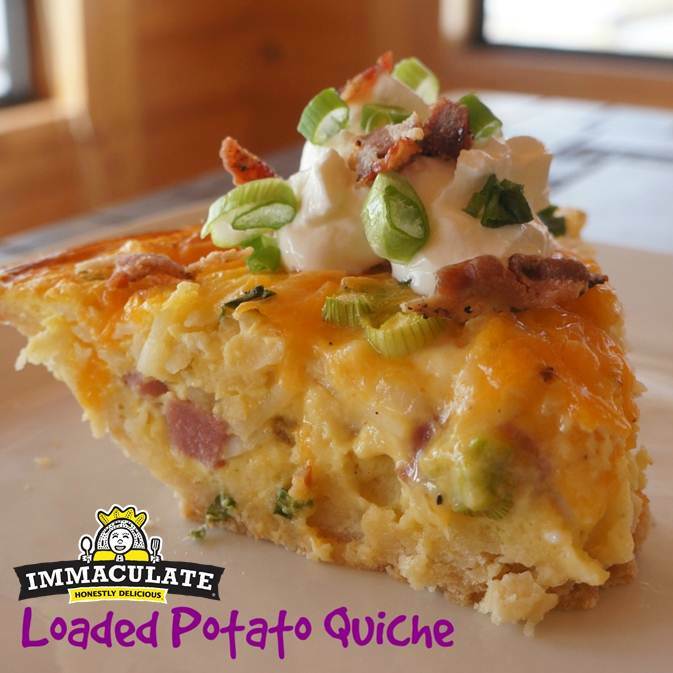 And so I give you Loaded Potato Quiche! Just layering on all your favorite ingredients like ham, hashbrown, cheddar cheese and bacon. Oh my word, what is there not to love!!! I will say that this is the first time I’ve tried to make a quiche crust using our Immaculate Baking Pancake & Waffle Mix, and I was pleasantly surprised at how flaky it turned out to be! Heat oven to 350°F. Spray 9 1/2-inch glass deep-dish pie plate with cooking spray. Place Pancake & Waffle mix in medium bowl. Cut in butter, using pastry blender (or pulling 2 table knives through mix in opposite directions), until crumbly. Add boiling water; stir vigorously until soft dough forms. Using fingers dipped in Pancake & Waffle mix, press dough on bottom and up side of pie plate, forming edge on rim of plate. Sprinkle ham, potatoes, cheese and 3 tablespoons onions in crust. In medium bowl, beat eggs, half-and-half and pepper until blended. Pour over ingredients in crust. Bake 1 hour 5 minutes or until knife inserted in center comes out clean. Let stand 15 minutes before serving. Top with bacon, sour cream and additional onions.